The effects from the rest of the galaxy become more pronounced, would be gradual and unexciting. But it’s proven to be far more complicated than anything researchers had imagined, with the spacecraft now encountering a strange region that scientists are struggling to make sense of. The sun produces a plasma of charged particles called the solar wind, which get blown supersonically from its atmosphere at more than 1 million km/h. Some of these ions are thrown outward by as much as 10 percent the speed of light. These particles also carry the solar magnetic field. Eventually, this wind is thought to hit the interstellar medium – a completely different flow of particles expelled from the deadly explosions of massive stars. The extremely energetic ions created in these bursts are known as galactic cosmic rays and they are mostly blocked from coming into the solar system by the solar wind. The galaxy also has its own magnetic field, which is thought to be at a significant angle to the sun’s field. 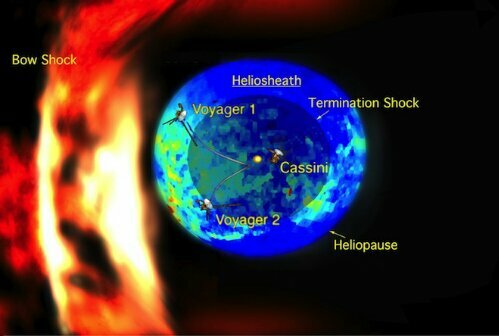 Researchers know that Voyager 1 entered the edge of the solar wind in 2003, when the spacecraft’s instruments indicated that particles around it were moving subsonically, having slowed down after traveling far from the sun. Then, about a year ago, everything got really quiet around the probe. Voyager 1’s instruments indicated at the solar wind suddenly dropped by a factor of 1,000, to the point where it was virtually undetectable. This transition happened extremely fast, taking roughly a few days. At the same time, the measurements of galactic cosmic rays increased significantly, which would be “just as we expected if we were outside the solar wind,” said physicist Ed Stone of Caltech, Voyager’s project scientist and lead author of one of the Science papers. It looked almost as if Voyager 1 had left the sun’s influence. So what’s the problem? Well, if the solar wind was completely gone, galactic cosmic rays should be streaming in from all directions. Instead, Voyager found them coming preferentially from one direction. This entry was posted in astrology, Uncategorized and tagged astrophysics, space, voyager.